Nov. 11, 2011, 11 a.m.
Plus: Reconciling digital journalism and institutions, a digital journalism pioneer retires, the search for a neutral way to tweet, and the rest of the week’s required reading. By Mark Coddington @markcoddington Nov. 11, 2011, 11 a.m.
Romenesko, attribution, and hair-splitting: Jim Romenesko, the dean of media bloggers, had planned on semi-retiring from the Poynter Institute at the end of the year, but he headed out the door seven weeks early yesterday after a brief, bizarre controversy. It started when his editor, Julie Moos, wrote a post taking him to task for “incomplete attribution” in his posts — essentially, using language from the posts he’s summarizing (and linking to) without putting it in quote marks. Moos wrote the post in response to questions from the Columbia Journalism Review as it develops an article on the subject. Romenesko wasn’t asked to resign: He offered his resignation at least three times before Moos finally accepted it. 10,000 Words’ Elena Zak praised Poynter’s transparency and Snarkmarket’s Robin Sloan defended its thoroughness, but to most observers, this was ethical hairsplitting run amok. Media consultant Mark Potts hit many of the main points in his defense of Romenesko, noting that no one has complained to Poynter about this in the decade he’s been blogging for them, and the Journal Register Co.’s Steve Buttry parsed out the difference between what Romenesko was doing and real plagiarism. Reuters’ Felix Salmon pointed to Romenesko’s stature in the blogosphere and his role in establishing the field’s norms: “If your guidelines go against what Jim is doing, then there might well be something wrong with your guidelines.” Later, he held the incident up as an example of applying by-the-letter traditional journalism rules to something that’s not traditional journalism. The Awl’s Choire Sicha took the opportunity to level a more serious charge at Poynter’s handling of Romenesko’s blog, saying that “Poynter has worked systematically to erode a fairly noble, not particularly money-making thing as it works to boost ‘engagement'” and other online-media buzzwords. I did talk with Jim on Monday about a variety of things related to the blog. We discussed his reaction to the candidates, I shared with him the new name I’d chosen for the blog, and I asked him about his decision to have someone represent ad sales for his new site, which seemed to contradict the spirit of the “hobby” site he described to me and others and also to conflict with his obligation as a Poynter employee in 2012 not to compete with the Institute. Unbeknownst to Jim, this issue had already been resolved by Wednesday afternoon. I spoke with Poynter President Karen Dunlap on Wednesday and she suggested we let Jim know our preference that he not solicit or accept advertising from our clients but leave it to him to do what he felt was right. It was my plan to call Jim on Wednesday afternoon to tell him that; obviously other issues arose of greater urgency to me and we never had that conversation. Google+ courts businesses: After banning businesses for its first four months, Google+ finally let them in this week, launching Google+ Pages, which gives accounts to business and groups. (Danny Sullivan of Search Engine Land put together the best walkthrough of what Pages are and how they work.) Businesses jumped right in, including, of course, news orgs: Breaking News put together a running list of news Pages, and one Fox News show announced it would do Hangouts with presidential candidates, starting with Mitt Romney next week. As Business Insider explained, Google has a big carrot to draw businesses in: Direct Connect, which allows users to go directly to a business’s Google+ Page if they the business’s name preceded by a “+”. Lost Remote’s Cory Bergman (who also runs the Breaking News Google+ account) said businesses should also get some SEO mojo from users clicking +1 on their Google+ account, which he argued was enough of a payoff to justify maintaining a Google+ account — at least for now, anyway. Social media guru Robert Scoble, on the other hand, was disappointed in Pages, calling them clumsy and difficult to manage. Fast Company’s Mark Wilson brought up the same point and added that since Google gives individuals two options of how to engage with businesses instead of Facebook’s single “Like,” most people will choose the weaker option. TechCrunch’s Jason Kincaid wondered what exactly that weaker option, giving the business a +1, will do. For Slate’s Farhad Manjoo, the addition of Pages was too little, too late for Google+. He declared the social network dead, a victim of Google’s launch-then-fix-it model that has worked so well for most of its products. “But a social network isn’t a product; it’s a place,” Manjoo wrote, arguing that Google should have let its users be more free to experiment to make up for its initial deficits. Mathew Ingram of GigaOM and the New York Times’ Nick Bilton countered that it’s too soon to give up on the network, because Google+ designed to be not just another social network, but instead the connective tissue integrating an entire way to experience the web. Google has some pretty good cards still its hand that can help it reach that goal, too, he said. Is future-of-news talk hurting journalism? : This week, we got the rare opportunity to have a substantive, big-picture (meta)discussion about the way we think about the future of news when the Columbia Journalism Review published a thorough critique by Dean Starkman of ‘future of news’ thinkers like Jeff Jarvis, Clay Shirky, and Jay Rosen. Several people objected to Starkman’s argument, starting with media strategist Terry Heaton, who countered that it’s not institutions the future-of-news people have a problem with, but hierarchical institutions, and former Wall Street Journal writer Jason Fry, who said that some forms of news are indeed a commodity. A few others, like Mathew Ingram of GigaOM and Steve Buttry of the Journal Register Co. argued that deep reporting vs. new media mastery isn’t an either/or proposition, pointing to examples of news organizations like the Guardian who do both well. Former Guardian digital editor Emily Bell also wrote about her old paper’s efforts in making a similar point, arguing that the spirit of muckraking is being carried on in these digital, networked initiatives. “The opening of electronic ears and eyes is not a replacement for reporting. It should be at the heart of it. And if it is not, then the institutions that Starkman laments might be to blame,” she wrote. Starkman responded by arguing that it all boils down to stories, but the future-of-news folks want to talk about something else, and here at the Lab, C.W. Anderson weighed in on with a smart post on the ways in which institutions can be forces for both good and ill.
A force for digital change in the newsroom: The New York Times announced this week the retirement (effective the end of the year) of one of the pioneers of news on the web — Martin Nisenholtz, a senior vice president at the paper. As the Times noted, Nisenholtz has been intimately involved in just about every major technological initiative the Times has undertaken since he came on board in 1995: Launching the website, moving it into mobile media and tablets, and instituting its paywall earlier this year. Dave Winer, who helped create RSS, pointed out that Nisenholtz made the Times the first major publisher to license its stories for RSS, making a significant contribution to the growth of the open web in the process. The Lab’s Joshua Benton used that story to illustrate that even if news orgs can’t invent these transformative web tools, they can still play a big role in their evolution and adoption. Media prof C.W. Anderson also noted another contribution Nisenholtz made — by allowing a scholar access to study his paper’s digital efforts, he helped revitalize the field of digital media sociology. A neutral way to tweet: If a few of the most recent sets of social media guidelines are any indication, news organizations are really struggling with the concept of their journalists’ retweets on Twitter. Several of those organizations have asked journalists not to retweet opinionated content without comment, lest they be thought of as biased themselves. Poynter’s Jeff Sonderman tried to resolve that problem with an idea for an NT, or neutral tweet, which people could use to retweet something while declaring their neutrality about it. Most journalism folks on Twitter didn’t like the idea, as Sonderman himself showed in his fine roundup of reaction. Many of them saw it as a way to avoid interacting naturally on Twitter, a “pacifier” or “high tech milquetoast,” in the words of j-profs Jay Rosen and Matt Waite. GigaOM’s Mathew Ingram expanded on the idea, calling it a solution to the wrong problem. “By pretending that their journalists don’t have opinions, when everyone knows that they do, mainstream media outlets are suggesting their viewers or readers are too stupid to figure out where the truth lies,” he wrote. — This week in News Corp. scandal: Rupert Murdoch’s son, James, told British Parliament he didn’t mislead them last time he talked to them. Or, as Gawker put it, he asserted that everyone’s a liar except him. The Guardian’s Roy Greenslade doesn’t believe him. Murdoch also said the company might still close its British newspaper, the Sun. And we also found out News of the World hired people to spy on their hacking victims’ lawyers. Guardian editor Alan Rusbridger put the scandal in perspective in a lecture. — New York Times media critic David Carr mused on the decline of WikiLeaks as an organization and its implications for radical transparency as a movement. Dave Winer and Mathew Ingram responded by questioning why the Times hasn’t supported WikiLeaks more itself. — Andy Rooney of CBS’ 60 Minutes, one of the icons of American broadcast television, died late last week at age 92. You can check out the obituaries from CBS and the New York Times, a set of his classic essays at Gawker, and a thoughtful remembrance by tech entrepreneur Anil Dash. — Finally, two great pieces of advice for two groups of people: Longtime News & Record editor John Robinson for newspaper editors, and MIT’s Ethan Zuckerman for media consumers (read: all of us). 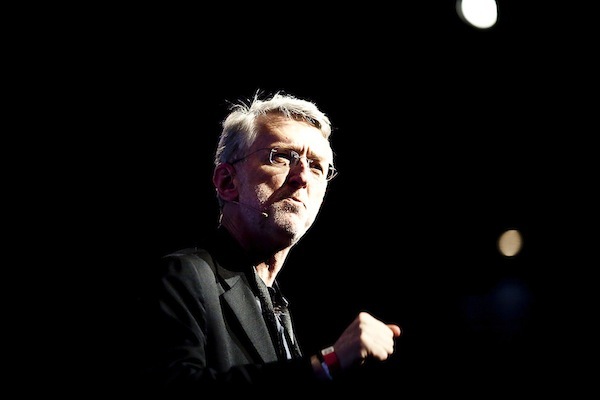 Photo of Jeff Jarvis by Re:publica used under a Creative Commons license. POSTED Nov. 11, 2011, 11 a.m.
Coddington, Mark. "This Week in Review: Romenesko’s exit turns ugly, and Google+ is open for business." Nieman Journalism Lab. Nieman Foundation for Journalism at Harvard, 11 Nov. 2011. Web. 23 Apr. 2019. Coddington, Mark. "This Week in Review: Romenesko’s exit turns ugly, and Google+ is open for business." Nieman Journalism Lab. Last modified November 11, 2011. Accessed April 23, 2019. https://www.niemanlab.org/2011/11/this-week-in-review-romeneskos-exit-turns-ugly-and-google-is-open-for-business/.